Figure 1. Treatment of COS cells with trichostatin A (TSA) increases the mono-methylation of Histone H3 at Lys4 detected by PathScan® Mono-Methyl-Histone H3 (Lys4) Sandwich ELISA Kit #7123. 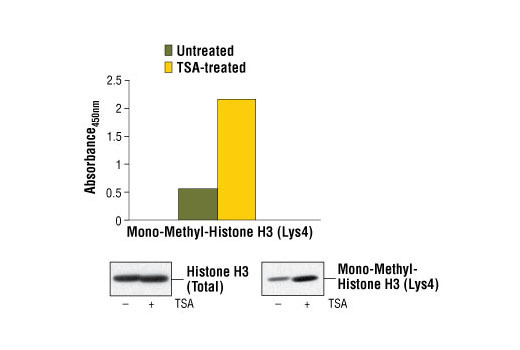 TSA treatment does not affect the level of histone H3 that is detected by Western analysis. COS cells (70-80% confluent) were treated for 16-18 hours with 0.4 μM TSA at 37ºC. Absorbance readings at 450 nm are shown in the top figure while the corresponding Western blots using Histone H3 Antibody #9715 (left panel) or Mono-Methyl-Histone H3 (Lys4) Antibody #9723 (right panel) are shown in the bottom figure. Figure 2. 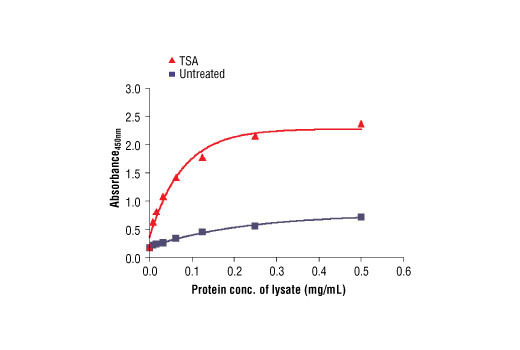 The relationship between the protein concentration of the lysate from untreated and TSA-treated COS cells and the absorbance at 450 nm is shown. The PathScan® Mono-Methyl-Histone H3 (Lys4) Sandwich ELISA Kit is a solid phase sandwich enzyme-linked immunosorbent assay (ELISA) that detects endogenous levels of histone H3 when mono-methylated at Lys4. A Total Histone H3 Rabbit mAb has been coated onto the microwells. After incubation with cell lysates, total Histone H3 is captured by the coated antibody. Following extensive washing, biotinylated Mono-Methyl-Histone H3 (Lys4) Rabbit Antibody is added to detect the Mono-Methyl-Histone H3 (Lys4) protein. HRP-linked streptavidin is then used to recognize the bound detection antibody. HRP substrate, TMB, is added to develop color. The magnitude of the absorbance for this developed color is proportional to the quantity of histone H3 mono-methylated at Lys4. CST's PathScan® Mono-Methyl-Histone H3 (Lys4) Sandwich ELISA Kit #7123 detects endogenous levels of histone H3 when mono-methylated at Lys4. As shown in Figure 1 using the Mono-Methyl-Histone H3 (Lys4) Sandwich ELISA Kit #7123, a high level of mono-methylation at Lys4 on histone H3 is detected in COS cells when treated with TSA. The level of total histone H3 (modified and unmodified) remains unchanged as shown by Western analysis (Figure 1). Similar results are obtained when NIH/3T3 and Jurkat cells are treated with TSA (data not shown). This kit detects proteins from the indicated species, as determined through in-house testing, but may also detect homologous proteins from other species. Hansen, J.C. et al. (1998) Biochemistry 37, 17637-41. Strahl, B.D. and Allis, C.D. (2000) Nature 403, 41-5. Cheung, P. et al. (2000) Cell 103, 263-71. Bernstein, B.E. and Schreiber, S.L. (2002) Chem Biol 9, 1167-73. Jaskelioff, M. and Peterson, C.L. (2003) Nat Cell Biol 5, 395-9. Thorne, A.W. et al. (1990) Eur J Biochem 193, 701-13. Hendzel, M.J. et al. (1997) Chromosoma 106, 348-60. Goto, H. et al. (1999) J Biol Chem 274, 25543-9. Preuss, U. et al. (2003) Nucleic Acids Res 31, 878-85.